FERRARIO - [ The Friendly Islands ]. FERRARIO, G. - [ The Friendly Islands ]. [ The Friendly Islands ]. - FERRARIO, G.
Title : [ The Friendly Islands ].. Size : 8.5 x 12.6 inches. / 21.5 x 32.0 cm. 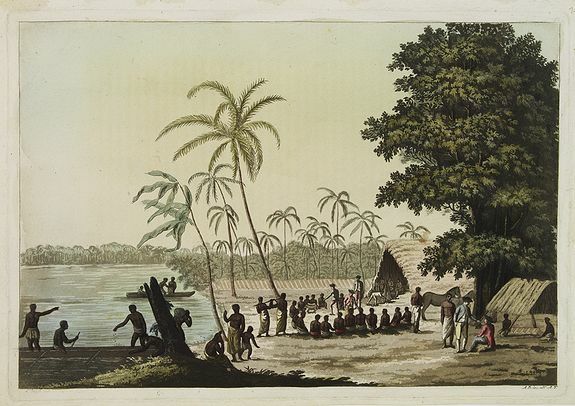 Description :Aquatint depicting seashore scene of the Friendly Islands. These islands are also known as the Friendly Islands because of the friendly reception accorded to Captain Cook on his first visit in 1773. Condition : Very good condition. Plate N° 81.